You’ll remember that a few months ago I wrote to you saying that I thought of you (our prayer letter readers) when asked by the Indians to find Christians to teach English in the jungle. Well the update on that is that a number of people have responded and some have come and actually done it!! 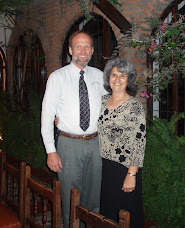 Mike and Donna were the first, then Don Dutcher and now Walter Ott have all come to Ecuador. 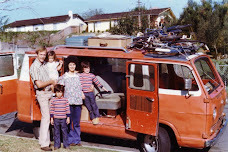 Don and Walter joined forces and are “team teaching” in a Waorani village at this writing. In addition to presenting a good platform to present the Gospel to unbelievers, teaching English gives excellent opportunity to befriend and empower tribal leaders for the Lord’s kingdom…not to mention all the fun these people are having. I love it!! I had the most exciting minute of my life just one day before Sharon returned from her 5 weeks in the US. The airplane was fully loaded and I had one passenger on board, Vicente. We took off out of Arajuno about 5 in the afternoon headed to nearby Villano. Although we were heavy the plane began its climb over the rugged jungle hills to the south. Once we got to cruise altitude I began my standard “headset conversation” by asking “Vicente, are you a Christian?” He responded, “Hermano Ricardo, you don’t remember me, but you shared the Lord with me 3 years ago.” Just as I was about to follow up that first question with, “That’s nice, but where would you go, should we die this afternoon…” the number one cylinder quit firing. A huge knot began tying in my stomach as I watched the cowling and prop violently shudder as three unbalanced cylinders struggled against each other trying to do the work of four to keep us in the air. The plane was going down, it was all jungle and it wouldn’t be long. I threw up my hand and began to cry out, “Please Lord Jesus save me!” Loudly…intently…earnestly… “Please Lord God…” louder…more intently…most earnestly… with all my being! Then Vicente came alive. His hand shot up. He started crying out too, repeating whatever I was saying. I remember feeling good about that. Atacapi is a new little strip tucked in a valley about half way between Arajuno and Villano. We narrowly made it, and by the very skin of our teeth. I couldn’t believe that minute really happened and now it was over. On the ground, Vicente’s first words were. “We have been born again I’m done with sin.” I was a little puzzled, by his application of “born again” but, I knew God was up to something in his life, because God is always up to something! I’m sure glad He answers prayer aren’t you? !